I warned you last week: energy-dense recipes are on their way! Which means my marathon training is on the way. I am slightly exaggerating at this point, as today will only be Day Three of the first week. But I am going out to run my first long run later today. 21k to start with! From previous marathon trainings I know that I will need to eat more, especially after the long runs. Marathon training leaves its mark on the hunger scale. In my case, I need normal-sized portions and snacks more often for one or two days after a hard or long workout, rather than increasing portion sizes of the three big meals. And better have good things ready, or otherwise you'll tuck into the first best junk or processed food that crosses your path. 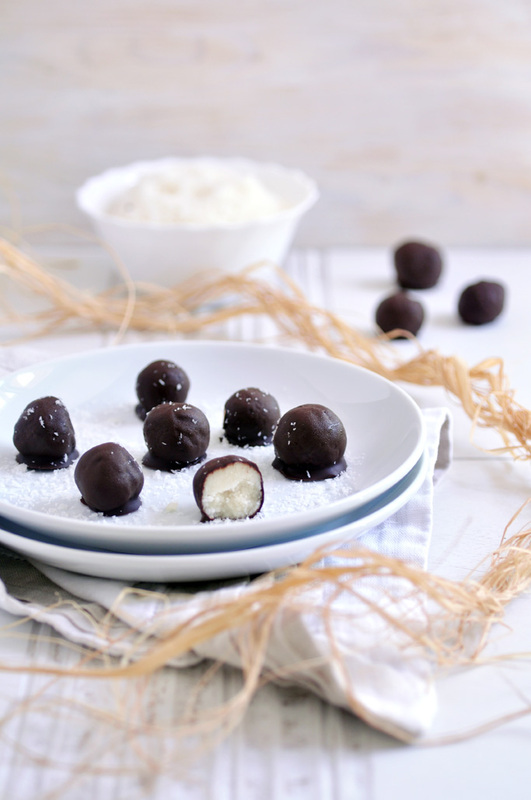 So here is calorie-dense recipe number one: Homemade Bounty Balls. Ever since I figured out the right proportions, these little treats were gone as soon as I made them. For several weeks I didn't get a chance to take pictures. My kids love them too. Nothing makes me more happy than when my kids favor my treats to store-bought junk. And thank God, my husband doesn't like coconut. So more for us. While this recipe may fall into the low-carb category, it's still a treat, but a very good one! With just four ingredients, you can make your own Bounty Bars or Balls, and it's as easy as can be. Enjoy! In a food processor, blend coconut, coconut oil and honey. Process until mixture is starting to stick together. Form balls of the size of a cherry out of the coconut mixture. If the mixture is too crumbly to work with, you may want to press it into the bottom of a loaf tin and then refrigerate. After 1-2 hours, the hardened mixture can be cut into preferred shapes. Chop the chocolate and melt it in a double boiler. Drop one ball of the coconut mixture at a time into the melted chocolate so that it's completely covered. Use a fork to lift it out and gently shake off the excess chocolate. Place on waxed paper and chill to set. Store in the refrigerator for at least 1 hour before serving.